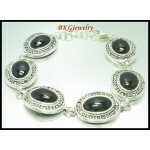 Marcasite BraceletThere are 9 products. Find the perfect marcasite bracelet. Our bracelets are ready to give the best shot on every performance and every moment you make. In other words, our marcasite bracelet and women are two inseparable things when it comes to beauty, elegant, feminine and art. - Weight: 8.00 grams. - Gemstone: Marcasite. 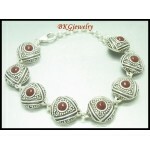 - Size: Length 210 mm. - Weight: 5.00 grams. - Gemstone: Marcasite. - Size: Length 190 mm. - Weight: 8.40 grams. - Gemstone: Marcasite. - Size: Length 170 - 210 mm. - Weight: 9.10 grams. - Gemstone: Marcasite. - Size: Length 170 - 210 mm. - Weight: 8.00 grams. - Gemstone: Marcasite. - Size: Length 165 - 210 mm. - Weight: 8.60 grams. - Gemstone: Marcasite. - Size: Length 200 mm. - Weight: 13.00 grams. - Gemstone: Marcasite. 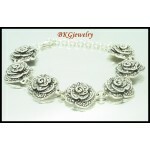 - Size: Length 200 mm.